We all know how easy it is for users to connect to open Wi-Fi networks in public places. Well, it is equally straightforward for criminals to position themselves near poorly protected access points – where they can intercept network traffic and compromise user data. A lack of essential traffic encryption for Wi-Fi networks where official and global activities are taking place – such as at locations around the forthcoming FIFA World Cup 2018 – offers especially fertile ground for criminals. With this in mind, can football fans feel digitally safe in host cities? How does the situation with Wi-Fi access differ from town to town? To answer these questions, we have analyzed existing reliable and unreliable access points in 11 FIFA World Cup host cities – Saransk, Samara, Nizhny Novgorod, Kazan, Volgograd, Moscow, Ekaterinburg, Sochi, Rostov, Kaliningrad, and Saint Petersburg. The main feature of the research is telemetry, which aims to secure users’ Wi-Fi connections and turn on VPNs when needed. Statistics were generated from users who voluntarily agreed to having their data collected. For the research, we only evaluated the security of public Wi-Fi spots. Even with relatively few public Wi-Fi spots in small towns, we still obtained a sufficient base for analysis – almost 32,000 Wi-Fi hotspots. 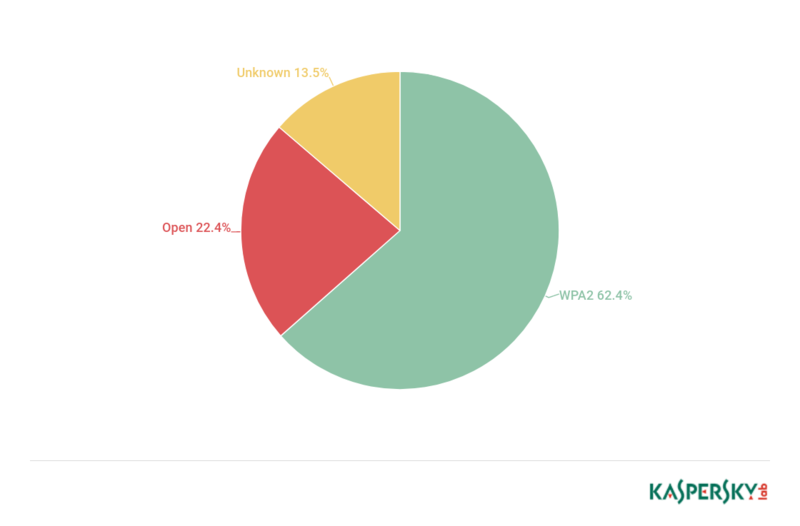 While checking encryption and authentication algorithms, we counted the number of WPA2 and open networks, as well as their share among all the access points. Using the methodology described above, we have evaluated the security of Wi-Fi access points in 11 FIFA World Cup 2018 host cities. Over a fifth (22.4%) of Wi-Fi hotspots in FIFA World Cup 2018 host cities use unreliable networks. This means that criminals simply need to be located near an access point to grab the traffic and get their hands on user data. Around three quarters of all access points use encryption based on the Wi-Fi Protected Access (WPA/WPA2) protocol family, which is considered to be one of the most secure. The level of protection mostly depends on the settings, such as the strength of the password set by the hotspot owner. The complicated encryption key can take years to successfully hack. It should also be noted that even reliable networks, like WPA2, cannot be automatically considered as totally secure. They still give in to brute-force, dictionary, and key reinstallation attacks, of which there are a large number of tutorials and open source tools available online. Any attempt to intercept traffic from WPA Wi-Fi in public access points can also be made by penetrating the gap between the access point and the device at the beginning of the session. The safest city (in terms of public Wi-Fi) turned out to be Saransk, with 72% of access points secured by WPA/WPA2 protocol encryption. 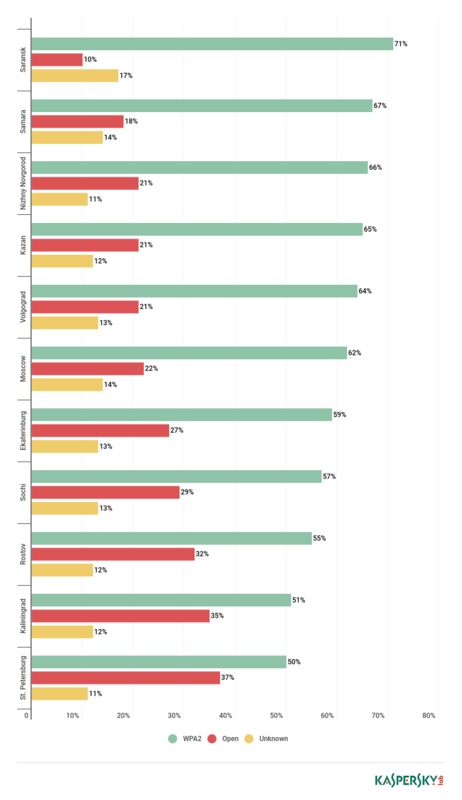 The top-three cities with the highest proportion of unsecured connections are Saint Petersburg (48% of Wi-Fi access points are unsecured), Kaliningrad (47%) and Rostov (44%). Again, the relativity of the results should be noted. Even a WPA2 connection in a cafe couldn’t be considered as secure, if the password is visible to everyone. Nevertheless, we believe that the methodology used represents the Wi-Fi hot-spot security situation in the host cities, with a fair degree of accuracy. The results of this research show that the security of Wi-Fi connections in FIFA World Cup hosts cities varies. Therefore. We therefore recommend that users follow some key safety rules. Whenever possible, connect via a Virtual Private Network (VPN). With a VPN, encrypted traffic is transmitted over a protected tunnel, meaning that criminals won’t be able to read your data, even if they gain access to it. For example, the Kaspersky Secure Connection VPN solution can switch on automatically when a connection is not safe. Do not trust networks that are not password-protected, or have easy-to-guess or easy-to-find passwords. Even if a network requests a strong password, you should remain vigilant. Fraudsters can find out the network password at a coffee shop, for example, and then create a fake connection using the same password. This allows them to easily steal personal user data. You should only trust network names and passwords given to you by the employees of an establishment. To maximize your protection, turn off your Wi-Fi connection whenever you are not using it. This will also save your battery life. We recommend you also disable automatic connections to existing Wi-Fi networks. If you are not 100% sure that the wireless network you are using is secure, but you still need to connect to the Internet, try to limit yourself to basic user actions such as searching for information. You should refrain from entering your login details for social networks or mail services, and definitely do not perform any online banking operations or enter your bank card details anywhere. This will avoid situations where your sensitive data or passwords are intercepted and then used for malicious purposes later on. To avoid becoming a cybercriminal target, you should enable the “Always use a secure connection” (HTTPS) option in your device settings. Enabling this option is recommended when visiting any websites you think may lack the necessary protection. One example of a dedicated solution is the Secure Connection tool included in the latest versions of Kaspersky Internet Security and Kaspersky Total Security. This module protects users who are connected to Wi-Fi networks by providing them with a secure encrypted connection channel. Secure Connection can be launched manually or, depending on the settings, activated automatically when connecting to public Wi-Fi networks, when navigating to online banking and payment systems or online stores, and when communicating online (via mail services, social networks, etc. ).